When it comes to online reviews, the majority of multifamily property managers say they respond. This is according to a recent 4 Walls survey of almost 300 multifamily property managers across the country. 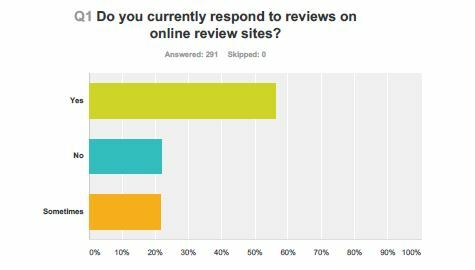 Seventy-eight percent of survey responders say they write replies to reviews on many popular review sites. And, of those, 67 percent said they reply to all reviews. Only 3 percent said they respond to positive reviews only, and about 15 percent said they respond to negative reviews only. The review sites that respondents most frequently reply to are Apartmentratings.com, Yelp.com and Google+ Local. Other popular industry review sites that are used are Apartmentguide.com, Apartments.com, Rent.com and Rentersvoice.com. Another study suggests that responding to reviews is important – potential tenants tend to check review sites before renting, and they have a favorable impression of property managers who respond to all reviews.